McMurray Musings: Where Have You Been? That is the subject line of the email I find in the inbox associated with this blog. That email is followed by two others from different people, expressing some concern that the blog posts have been a bit on the sporadic side recently and hoping that I am okay. Well, where to begin, really. This has been a summer unlike any other in my world, so perhaps I will post a bit today to just bring my readers up to speed on where I have been, and why there has been a bit of hiatus on the blog. At the end of June the Intrepid Junior Blogger left to spend the summer with her father in Calgary. I don’t usually cry when she leaves on these visits any more, as I have become accustomed to the weekends when she is away, but I admit on this occasion I did as her plane departed. The hardest part of single parenting is this moment, I think, when she is not with me, and on that day in June the next two months loomed in front of me like a spectre. It has been almost a month now and I miss her fiercely, but I know this is a good introduction to two years from now when she will likely leave home for good to head out on her own to University. I will be honest, too, as her absence has likely impacted my desire to write in a personal manner, like in this blog, as it colours everything I feel right now while I work my way through parenting from a distance and being separate from the one person in this world I love more than anyone or anything else. The absence of the IJB also seems to unleash some sort of mothering instinct in me, as last year when she was gone I managed to adopt a hedgehog (as regular readers may recall). The hedgehog, named Ciel, has never really warmed to us and continues to be a small hissing ball of fury most of the time, and we tend to tiptoe gingerly around him as he is cranky at best and ferocious at worst, but for better or worse he belongs to us now. 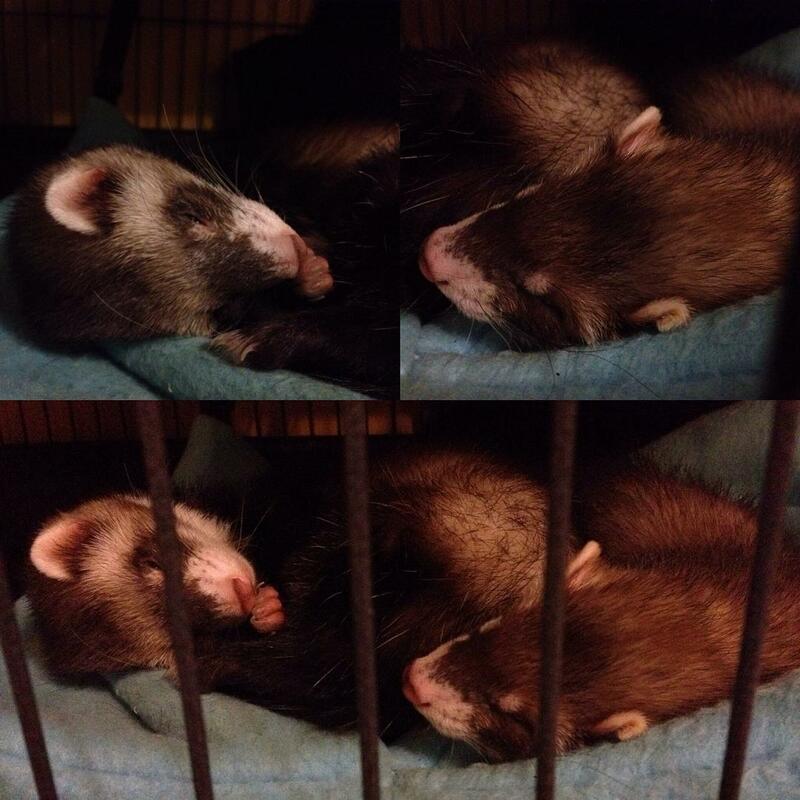 And this year, just a couple of weeks ago, I made a fateful stop in a local pet store and spied two small ferrets, about 12 weeks old, in need of a new home. I don’t claim to be an expert in much (maybe only in shoes, really) but I know a thing or two about ferrets, having owned them for decades, and so it was Patty and Liz ended up coming home with me to join our little resident ferret duo, creating a new ferret gang. The dynamics are pretty intriguing, as the smallest and prettiest resident ferret has decided she is the alpha and is spending her time trying to ensure the other three fall into line, despite being far smaller than the new arrivals (and new arrivals who are still growing, too). There is a reason they call a group of ferrets a “busy”, because having four ferrets out at playtime is much like one adult watching a dozen toddlers. They may each weigh about a pound, but they are each at least 20 pounds of mayhem. This summer I was honoured to be recognized along with eleven other local women at the annual Girls Inc. “Women of Inspiration” celebration. The reasons the other women were nominated was clear to me when I watched the video depicting each of the inspiring women, although why I was included in this notable group seemed less clear to me. I suppose all I can say about inspiration is that one simply needs to be true to oneself and follow your dreams, carving your own path if necessary to do so. I am touched that I was included in this celebration, and even more touched that over the course of the summer two other people told me how my journey and actions have inspired them to follow their own path. Without a doubt I have been busy at work this summer as we celebrated the grand opening of Shell Place. Two CFL games and one concert helped me stretch my wings both professionally and personally, working with media and professional sports organizations from around the country. For the recent Aerosmith concert I had the opportunity to both work in my professional capacity and as a runner for the tour management, which I have done before and enjoyed every single time. There is something incredible about chatting with people who drive million-dollar tour buses and learning about life on the road, about their pride in what they do, about the places from where they come and sharing a bit about life here. 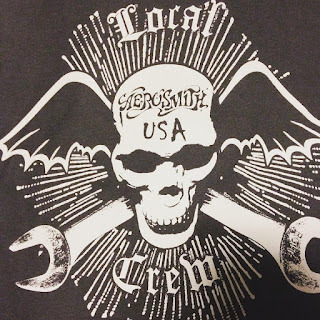 This last adventure as a tour runner involved the delivery of a lot of pizza and even earned me a t-shirt proclaiming me to be “Aerosmith Local Crew”, a title I will proudly wear and one I never thought I would carry. I have been quietly observing the changes in our community as the economic impact began to make itself known. I have lived through the dips and dives before, and in a resource based economy one becomes accustomed to them, but I am troubled by the number of people I have known for years who are making the difficult decision to leave our community. As one said to me: “If I am not making any money here I may as well go home to Nova Scotia and live in my house close to my kids and grandkids and not make any money”, a sentiment with which I cannot argue. Some of these people will likely return when the economy picks up again, but some will likely be lost forever, and I find it hard to say goodbye to people of whom I have grown so fond and who are part of the rich tapestry of our community. I have watched the layoffs and downsizing, and I have watched as moving trucks roll onto my street and roll away as houses sit vacant waiting for new owners to take a chance on us and our prospects for the future. I am, as always, an optimist, but it is impossible to not be impacted by these changes and to feel some degree of pain for a community that is going through a tough time. I know we will rebound, and I know we will be okay – but there are changes occurring, and some of them are hard to witness when you love this place in a way you have never loved another. I have been taking a break from provincial politics, seeing it as more peripheral than central in my life. There is no doubt that after having invested in the PC campaign in 2012 I felt invested in the party, and there is equally no doubt that I felt betrayed by how some of those who came into power after that election behaved. The saga of Redford, the absurdity of Bill 10 and more hurt me deeply, particularly as the IJB had a stake in it all too, and I saw as her idealism and enthusiasm began to fade and be replaced with a jaded and cynical take on the political world. After the NDP sweep of the province I realized I had been a witness to the last dying gasps of a dinosaur of a political party, one that failed to adapt to a brave new world around it, and that faced almost certain extinction. I have taken time away from it all to mull it all over and to watch the new dynamics unfold, content to be a distant observer. I am still a political junkie, but I am one who is taking a bit of a break to recover from three years of a roller coaster ride that no one could have predicted. I have been working on my house in a way I never expected or anticipated. It was when I found myself in the checkout line at Rona with a drill and a caulking gun that I realized how much I have changed. A small flood in my basement after a recent rain led to pulling up baseboards and taking apart eavestroughs, determined to prevent it from happening again and stubbornly forging ahead to do it on my own. I now know more about eavestroughing that I ever imagined I would, and it is the kind of knowledge I tuck away and savour a bit as it is so far from what I would normally carry in my head. This, like many other tasks homeowners carry out, is an ongoing one and this weekend will find me re-installing baseboards. I have been here as always, working away at my job and my house, missing the IJB and cuddling the inhabitants of the Triple M Zoo (except the hedgehog, who is about as cuddly as your average hand grenade), and making a lot of quiet observations that are being recorded as I begin to formulate the outline in my head for the book I am looking to write about life in a northern town, a place of trials and tribulations, a place of success and failure, a place where one part of my life ended and where who I am as a person really began. I must be honest, too, as on several occasions over the past few weeks I thought of ending this blog, of posting one final message and then allowing McMurray Musings to fade slowly over time, as who I am now is so very different from who I was when this all began. I have spoken about this with friends and thought about it late at night, staring into the dark and wondering if I wanted to continue to write this blog. It has become so much more complicated in recent years, as instead of being an observer of things central to life in this community I have become part of them, someone with “a dog in the fight”, and I have learned that I must exercise both discretion and caution when I write as I am no longer just an opinionated woman with a blog. And yet I find myself drawn back to this blog, because even as I have changed (and my reality has changed) this is where it all began, and to some degree this is where it continues. So, that is where I have been. I will continue to post – perhaps not as frequently over the summer as I still have those pesky eavestroughs to contend with – when I can and when the urge strikes me. I have some posts in the works already, as I have some things to share and some thoughts to express. I genuinely hope my readers, wherever they happen to be, are having their own summer adventures just as I am. Some are likely quite exciting, and some are less so (like eavestroughing repairs), but all are contributors to that crazy thing we call life, and where we have been. Please don't stop writing! And if you do decide to finish Musings, perhaps start fresh somewhere new? I find your writing interesting as well as engaging, personal yet deeply rooted in this community I'm slowly but surely getting to know and care for. You have something in particular to say and it has coalesced into an idea for a book? That is something plenty of bloggers probably wish would occur for their own writing. I freely admit that my blog is the perfect outlet for what I have to say that doesn't much need to be said! If that makes sense. In other words, a book it would NOT make. But it's been great writing practice and has developed my voice. Now, if I just had something to SAY ... ! It's been good to hear how things are going up there and how the economic change is affecting your neighbours on the ground. I almost called you when I was in Fort McMurray in early July, after I saw the picture of women of inspiration. Congratulations!